My personal list of “Heidi’s Favorites” contains more than a few things that occur during or are somehow related to fall. Sweaters, a drive up a winding canyon painted with autumnal tones, hot chocolate at my favorite shop at Deer Valley, lighting candles that smell good enough to eat (so sad when my kiddos come home from school and realize that it just mom’s candle and not mom’s baking that smells so delectable), caramel apples from the state fair, and the fact that it becomes perfectly acceptable and oft encouraged to enjoy all things pumpkin and cream cheese. Mysteriously, fall is the only time of year that my children will actually eat anything containing the aforementioned ingredients. They’ll wise up some day. As far as I am concerned the onset of fall is time for celebration! You may or may not fit into last year’s jeans, but hooray, all the back to school sales are still on. Go for it! And let us not overlook the fact that we successfully survived summer! You made it through every last day of summer, you scavenger hunted your way to finding every last darn thing on the school supply list for 3 different schools (okay, you made your 9th grader use an old set of dividers from last year—think of this as a classy “regift” to himself), and you still have a few weeks before you have to create magical, mystical Halloween costumes. As a parent, one of the websites that I relied on heavily throughout the summer was Wumpsee.com. This website manages to streamline and organize all events and activities going on throughout the state. Thank you Wumpsee.com. Here is my fall 2012 bucket list…minus the visit to the Haunted Cave. Read on for explanation. SEPTEMBER September 6-September 16: Utah State Fair The smell of fried foods wafting through the air, the gleeful squeals of little ones, pink piglets(!) and grandstand entertainment = a perfect way to spend a day. Just in case you are experiencing withdrawals from the Olympics, relax, someone already thought of that. There will be Olympic diving at the fair this year, as well as barrel racing, a rodeo, and all things on a stick. September 22: Scarecrow Festival I call this a “two-fer” event. 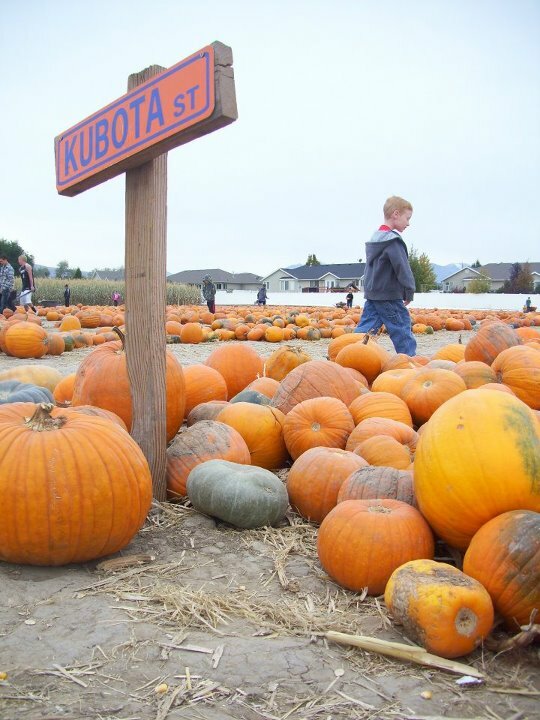 Not only do you get to create your own scarecrow and enjoy pumpkin painting, cookie decorating and games, you also get to relish in a drive up the canyon to beautiful McPolin Farm in Park City. As parents, aren’t we always searching out opportunities to strongly encourage our teenagers to unplug and enjoy nature? This is what I call a real force of nature. Love me a pun. Seriously, the landscape should be stunning at this point in the season and you can always stop at the outlets afterward if the older kids put up too much of a fight. Must buy tickets in advance. September 29: National Public Lands Day Visit Arches or Canyonlands National Parks for free this fall. Sneak in a weekend vacation—the average high in Moab is still around 80 degrees in September! Again, I am all about road trips that sort of coerce everyone into some good family together time. The great thing about a trip like this is children are very, very tired at the end of the day and have had some crisp air and exercise to boot. OCTOBER October 18-23: North Logan Pumpkin Walk You know what I really love about this event? It has been going on since 1983 and was actually started by a farming family named the Beutlers who made homemade cookies and cider from their orchard for the neighborhood children to enjoy while walking through displays of local produce turned into amazing displays. Past year’s exhibits included a showing from Angry Birds, a chilly scene from CandyLand, Smurfs, and fun from The Muppets—all created from vegetables. All this and free? Yes! October 25-27: Annual Syracuse Pumpkin Walk Why another pumpkin walk, you ask? Because I am a sucker for two things, (okay, that is a lie…I am a sucker for a lot of things) but these two pertain: fun and free. This pumpkin walk is held at Centennial Park in Syracuse. You will be amazed at the creativity of your fellow-Utahans when it comes to power-tool pumpkin decorating. Seriously. NOVEMBER I really want you to enjoy fall. I really want you to try not to give in to the “Christmas- decorations-for-sale-the-day-after-Halloween” shenanigans. By the time November rolls around, you should be able to sit back and reflect on some tender memories and appreciate that little holiday called Thanksgiving which gets swallowed up between Halloween and Christmas. There I said it. Christmas. You thought Wumpsee.com was crazy busy during the fall, just wait until December blows in. Now, I don’t want to scare you, but Christmas is coming. I plan to thoroughly enjoy my November this year, in spite of the fact that Christmas will be here tomorrow. My To Do List for November: *Try to convince my family that a buffet can be an awesome way to enjoy Thanksgiving dinner sans dirty dishes, cranberry sauce sticking to the floor, and potato peels stuck in the disposal, again. *Check the Hardware Ranch website to find out when their sleigh rides begin. *Since my family will never go for the buffet idea (Mom…no leftovers?! ), make a banana cream pie even though no one else really likes it but me.